A few days ago I was chatting to Jess on Twitter about her upcoming order from Etsy seller Love To Love You who custom-made this great skirt for me a few years ago. Jess had just bought a “very Emma Pilsbury” yellow and navy ruffle-bum skirt, and was anxiously awaiting its arrival because she’s suffering from bored-of-my-clothes-syndrome (I am totally familiar with that feeling). Of course, the moment Jess mentioned the ruffle-bums I was off again, lusting after Love to Love You‘s ultimate bustle skirt. I originally found Loni and Love to Love You after searching for bustles on etsy and obsessively stalked her store until I could make a decision about skirt & ruffle fabric choices; but ironically, when the day came it was the ruffle front skirt that I ended up buying. Of course, now I’m thinking maybe it’s time I rectified that, but my wardrobe is straining at the seams, and I want to do another big eBay sale to help fund my upcoming Wedding Dress Purchase (eek!). Maybe I’ll have a little left over from that, and I can finally succumb to the siren call of a Love To Love You Ruffle Bum Skirt. Until then I’m getting some more wear out of the beautifully blue hues of my original order. 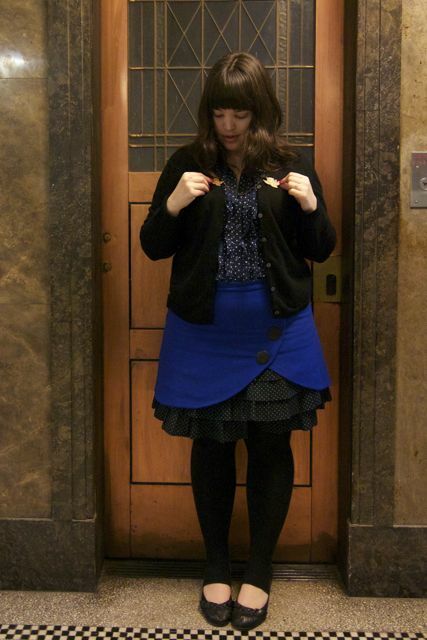 This entry was posted in Uncategorized and tagged cardigan, cold, etsy, skirt by lillipilli. Bookmark the permalink. Thanks for the mention, it made my day! And thanks for putting me onto Love to Love You in the first place. And Boots for Broads and Eliza Parker and all the rest! I’m just about to put in an order for the Yvette boots on Boots for Broads. They are the boots I’ve been looking for my whole life! How exciting!!!! Are the sizes for the skirts american sizes? so a 10 s like a 14 in Australia? I’m not sure Rochelle- I just got mine custom-made, it’s no extra cost. Thanks-I saw one i loved but was in a 2 or 4 and i thought eek!!! Hope u love it when you get it!!!! This blue, in the skirt, is such a wonderful winter colour – so positive, a good reminder that the sky wont be grey always. Eep! 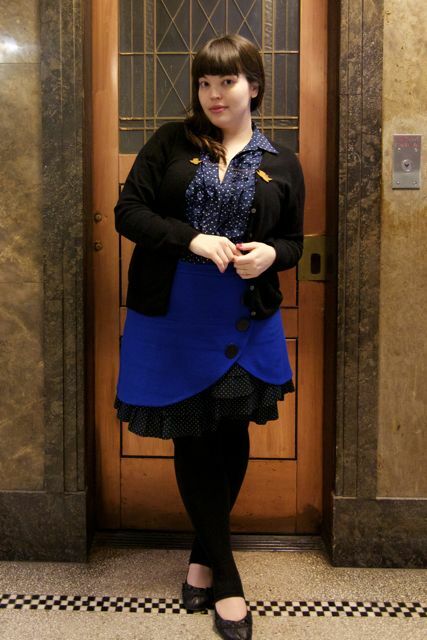 I’ve had about a half dozen Love to Love You skirts in my Etsy faves for YEARS. Love this one on you. I really like this outfit! I especially like the leggings. I’ve been away all week in the wilds of Dorset with NO PHONE COVERAGE OR INTERNET (that needed capitols!) and I get back to see you’ve blogged lots! 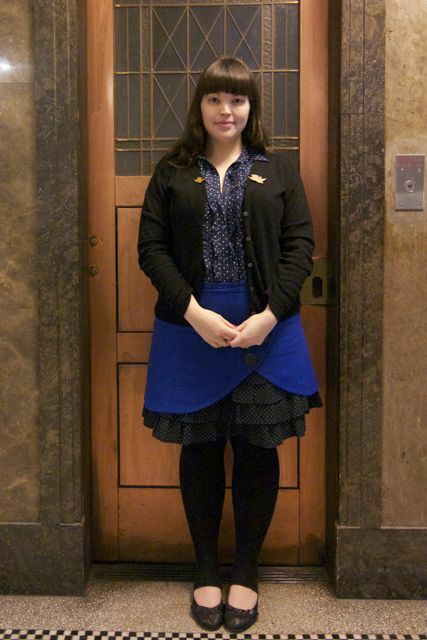 Thanks for showing off the skirt I made you! You look absolutely lovely it in- but then again, you look lovely in everything you wear. I’m looking forward to making you a ruffle bum in the future. Wow, this skirt is ridiculously cute! Thanks for turning me on to Love to Love You. I’m pretty sure that I will be ordering one soon! Will check etsy for this in a while. So excited!